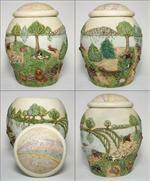 This urn is sure to be very popular among small dog owners. “Rainbow Bridge” is a lidded dog themed cachepot, created in the USA by Angie Caradonna and made of crushed marble and resin. Beautifully decorated, Angie based her sculpture on the classic bereavement poem of the same name. She plans to donate a portion of her royalty from “Rainbow Bridge” to the Canton Ohio Area Humane Society, where her family rescued their newest family member, Abby Jane, in December 2007. 5 1/2" High x 4" Diameter Urn weight: 2.5 lbs. 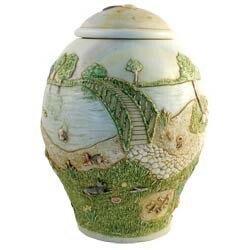 I recently ordered this urn. It is beautiful!! Have not put my precious baby in the urn as of yet, because I am not sure on how to seal it. Please give me some suggestions..